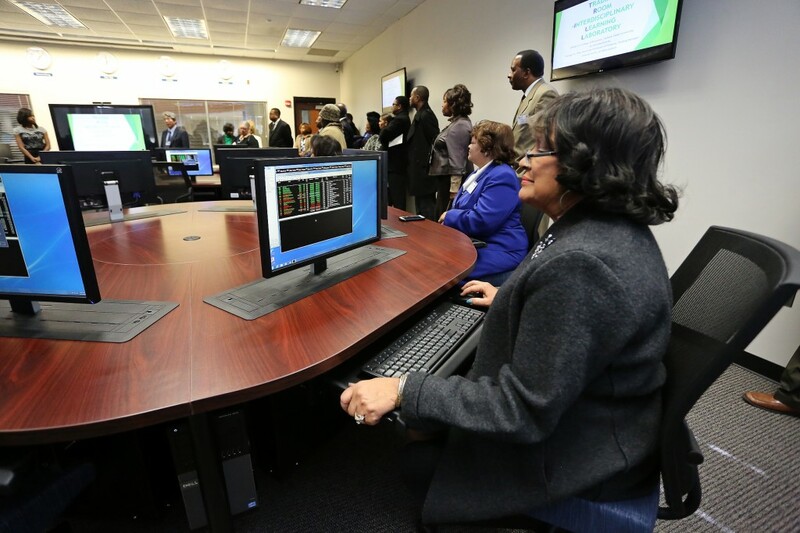 Jackson State University has opened a state-of-the-art trading room that offers up-to-the-minute movements of publicly traded stocks, 24 student work stations, and some of the most sophisticated financial software on the market. “This is as good as anybody has anywhere,” said Gene Delcomyn, senior executive vice president of BankPlus, a partner in developing the center, during a ribbon-cutting ceremony at the College of Business rotunda on the JSU campus on Friday. 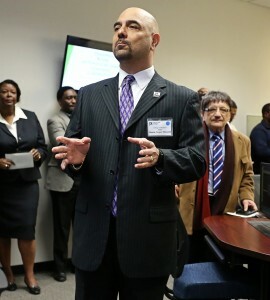 JSU is one of the few historically black colleges and universities to have a trading room as well as an accredited business college, said Dr. Ramin Maysami, dean of the College of Business. The 1,116-square-foot Trading Room-Interdisciplinary Learning Lab (TR-ILL) will be used to train business students about financial investing in real-time, giving them hands-on experience in handling and analyzing economic and financial data, university officials said. According to Dr. Dal Didia, chair, Department of Economics, Finance and General Business, the department has been working to create the trading room since 2011. “Very few universities in the United States have this,” he noted. The facility will be “a superhighway of talent that goes both ways,” said Bob Spring, People FIRST director of Horne, LLP, that also partnered to create the center. The certified public accountancy and business advisory firm also announced five internships with JSU. “It’s a profound day” for JSU, said Dr. Mary M. White, interim vice president of institutional advancement, noting that other departments and partners will also be using the facility. It was “truly a public/private partnership,” said Dr. James C. Renick, provost and senior vice president for academic and student affairs. The TR-ILL is partially funded by a Title III grant from the U.S. Department of Education. Dr. Frederick White, Title III director, said the lab falls within the strategic initiatives of the university. It will be managed by Dr. Geungu Yu, associate professor finance. The lab uses TELEMET-ORION software, which includes investment analysis, company research, economic data, portfolios and spreadsheets. Databases include coverage of more than 5,400 publicly traded companies; historical pricing data for daily trade volume, and open, high, low and closing prices for more than 20,000 publicly traded companies. For more information, contact the department, at: 601-979-2531.